Charles Krauthammer, who passed away this June, was a well known political columnist, but his disability was less widely known. The writer of this article says that while he rarely spoke of his disability, his example did not go unnoticed by at least some disabled writers. A radio series on the economic forces that shape the disability experience. 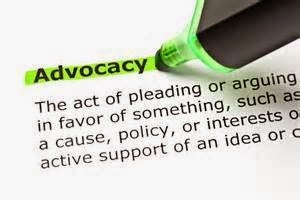 The former head of the Autistic Self Advocacy Network, (ASAN), discusses how disability issues affect his politics and voting decisions. 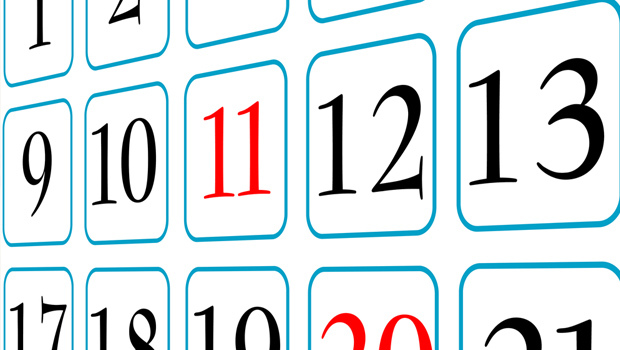 This is the first in a series of monthly guest posts on the NCCI blog. For more information on guest blogging, click here. Discussing the weight of responsibility put on people with disabilities to arrange and justify their own accessibility. 3. Please Don't Call My Autistic Son "Buddy." A parent explores the nature of well-meaning condescension. My sophomore year of college was when I felt at my lowest. I had gone off my medication after becoming frustrated with the side effects and began drifting away from my friends. I dreaded calling my parents for fear I would upset them if I admitted how bad I felt, and getting to class felt impossible most days. My depression had drawn me into a dark place, and while I was familiar with the ups and downs that came with my mental illness, it felt at times I had nothing significant to keep me going in life. I was isolated from those who might give me support and unsure what I would be able to do with my degree when I got it, or if I would even be able to graduate. Everything felt uncertain and bleak. I remember sitting in my dorm room and pondering why I kept going. Why was it that I kept fighting through the pain I was feeling when everything felt like an uphill battle? It took me a good deal of thinking to answer this question, but when I did I laughed out loud. When It came right down to it, the reason I was alive was because my favorite web series hadn’t ended yet, and I wanted to see how turned out. It sounded ridiculous to admit it to myself, because what was keeping me alive wasn’t some sought after life goal like graduating or the support of someone I cared about. It was something small and insignificant in the grand scheme of things. It was just a web series. But the more I thought about it, the more I realized how much the small things in my life had been helping me. When deep in my depression, I couldn’t focus on the bigger picture of life. Yes, I wanted to graduate and get a great job doing somewhere that I loved, but those concepts felt so unreal and far away from me on days when even getting up out of bed or showering felt like an impossible task. But it was easy for me to look forward to show that I liked. It was something to look forward to that wasn’t a distant idea that would happen years from now. Maybe it was small, but it helped me look forward to being alive. The web series finally ended, but by then I had already made a short list of little things I was look forward to. There was a video game coming out in a couple of months that I really wanted to try, a local band was playing a show next week that I really wanted to see, the dining hall was having my favorite dish tomorrow and I couldn’t miss out on that. They were all small things, but they kept me going while I figured out what I needed to do to feel better. Eventually I told my parents what was going on. I started up on a new set of medication and realized that therapy was an important part of dealing with my depression. As I began to feel better I began to hang out with my friends more, and no longer being isolated helped my mood greatly. But I wouldn’t have gotten that far without those small things I looked forward to. It doesn’t matter how small it may be, or how ridiculous it may sound, if you have little things that you look forward to, make a list of them. They can help get you through tough times and make your day a bit better. This is the first guest blog in what will be a monthly series. Each month NCCI will choose up to 2 submitted blog posts from North Country writers on disability-related topics. This is a paid opportunity. Click here for more information. Episodes from two separate audio podcasts that describe some of the founding personalities and ideas of the Independent Living and Disability Rights movements. What happens when two worthy social movements clash. 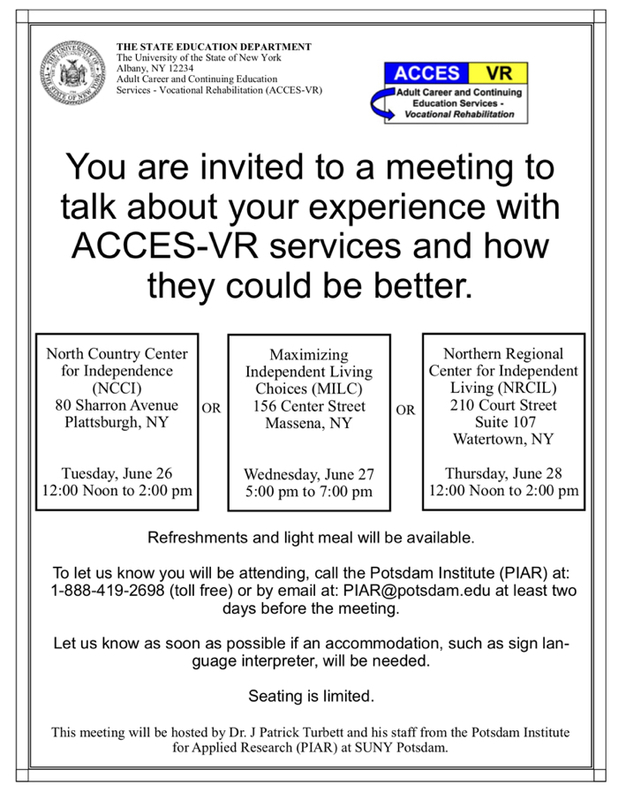 You are invited to a meeting to talk about your experience with ACCES-VR services and how they could be better. Refreshments and light meal will be available. To let us know you will be attending, call the Potsdam Institute (PIAR) at: 1-888-419-2698 (toll free) or by email at: PIAR@potsdam.edu at least two days before the meeting. Let us know as soon as possible if an accommodation, such as sign lan- guage interpreter, will be needed. This meeting will be hosted by Dr. J Patrick Turbett and his staff from the Potsdam Institute for Applied Research (PIAR) at SUNY Potsdam, on behalf of the NYS Education Department, ACCES-VR, Adult Career and Continuing Education Services, Vocational Rehabilitation. A hopeful but critical look at what the disability rights movement has done, and what it needs to do better. 2. People With Disabilities Are ‘Severely Underrepresented in Elected Office.’ These Candidates Hope to Change That. This Midterm Election year, people with disabilities are starting to look not just at voting, but also running for elected office. A radical re-examination of what it means when people we are trying to help fail or disappoint us … very relevant to our approach to the disability community. (Note: This article contains some strong language).